SINGAPORE, 23 January 2018 – Singapore Changi Airport registered a strong performance in 2017, handling a record 62.2 million passenger movements (+6.0%) for the year with 373,200 landings and take-offs (+3.5%). 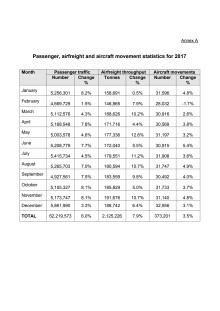 Airfreight throughput also grew by 7.9%, crossing the 2-million tonne mark for the first time, to reach 2.13 million tonnes for the year. December was once again the busiest month of the year, with Changi Airport handling 5.86 million passenger movements (+3.3%), 32,960 aircraft movements (+3.1%) and 188,740 tonnes of airfreight throughput (+6.4%). The busiest day of the year was 22 December 2017 (Friday) with 208,043 passengers passing through Changi’s terminals – a record for the airport. In 2017, traffic across all regions saw positive growth, with Southeast and Northeast Asia contributing to about 70% of total traffic. Among Changi’s top 10 country markets, China and India led with a robust double-digit growth of 12% and 16%, respectively. 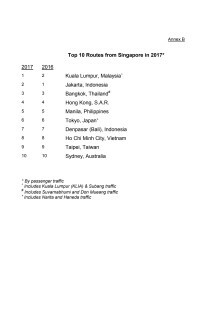 Among Changi Airport’s busiest routes, Kuala Lumpur (+7%) replaced Jakarta as Changi’s top city link for 2017. Among Changi Airport’s top 20 destinations, Guangzhou was the fastest growing (+15%), while Brisbane, Penang and Phuket recorded growth of at least 6%. During the year, Changi Airport welcomed three passenger airlines – Hebei Airlines, Norwegian and US-Bangla Airlines, to its family of over 100 airlines. Ten new passenger city links were also established, to China (Harbin, Shijiazhuang, Yantai), Greece (Athens), India (Madurai), Japan (Hiroshima, Okinawa), Malaysia (Bintulu), Sweden (Stockholm) and USA (Honolulu). Growth was observed for airfreight throughput across imports (+8%), exports (+14%) and transshipments (+4%). The top five country markets for airfreight were China, Australia, Hong Kong, the United States and India. Changi Airport Group (CAG) formalised the Pharma@Changi initiative in October 2017, together with nine other partners from across each node of the supply chain. Under this initiative, the companies will jointly pursue the best standards in pharmaceuticals handling, and will promote Singapore Changi Airport as a trusted and reliable pharmaceuticals air cargo hub in the region. Earlier in the year, Changi Airport also became the first airport community in Asia Pacific to attain the IATA CEIV Pharma certification. The opening of SATS’ new eCommerce AirHub in April also enhances Changi’s eCommerce mail sorting capability to support the growing eCommerce market with its state-of-the art automated airside eCommerce mail sortation facility. There are now more passengers who travel on multiple transport modes on their journeys. To cater to these emerging passenger segments – including fly-cruise and fly-ferry, CAG worked closely with our partners to offer more travel options. In 2017, a new shuttle service was launched to facilitate transfers between Changi Airport and Tanah Merah Ferry Terminal, and this has seen a ridership of close to 10,000 passengers in its seven months of operations. To grow the fly-cruise market, CAG has also signed various collaborations with cruise companies – which are expected to bring in more than 600,000 visitors over a four-year period. Transfer and transit passengers continue to be an important segment for Changi Airport. Under the ongoing Changi Transit Programme, about 700,000 passengers claimed transit rewards while shopping in Changi in 2017. CAG has also continued efforts with its partners to grow the MICE segment in Singapore. Changi Airport clinched a total of 26 Best Airport awards in 2017, bringing the total to 557 to date. This includes the World’s Best Airport accolade at the 2017 Skytrax World Airport Awards, an award Changi achieved for the fifth year in a row and the eighth time in its history. 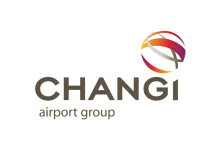 Changi also received Business Traveller UK’s ‘Best Airport in the World’ award for the 30th consecutive year. Mr Lim Ching Kiat, CAG’s Managing Director, Air Hub Development, said, “2017 was a significant year for Changi Airport, as we saw strong growth in both passenger traffic and cargo throughput, resulting in record numbers. We also opened the new tech-friendly Terminal 4, which served 1.3 million passengers in its first two months of operations. With the establishment of new city links to many parts of the world, and the launch of a number of non-stop long haul routes, we have also expanded our connectivity, providing greater convenience for our passengers. Demand for air travel in the Asia-Pacific is expected to triple in the next two decades. With the opening of Jewel Changi Airport and the completion of Changi’s Terminal 1 expansion in 2019, Changi Airport’s total handling capacity will increase to 85 million passengers per annum. This will help secure Changi Airport as a leading air hub with sufficient capacity to ride on the projected growth in air traffic in the region. The monthly breakdown for passenger, airfreight and aircraft movements for 2017 can be found in Annex A. See Annex B for the full list. A certification by IATA which ensures international and national compliance to safeguard product integrity of pharmaceutical products shipped by air cargo players. Under the current programme which runs from 01 April 2017 to 31 March 2018, eligible passengers transiting through Changi Airport with Singapore Airlines, Silkair or Air New Zealand on a return trip may receive up to S$40 worth of Changi Dollar Vouchers. Terminal 4 commenced operations on 31 October 2017. Changi Airport is the world's sixth busiest airport for international traffic. It served a record 62.2 million passengers from around the globe in 2017. Changi Airport has 400 retail and service stores, as well as 140 F&B outlets. 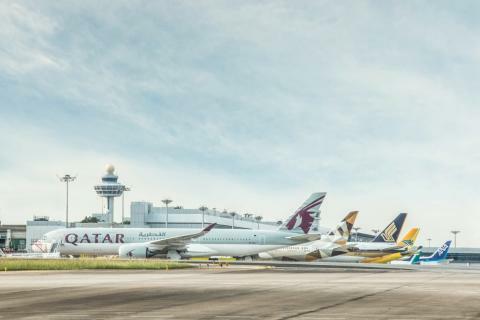 With over 100 airlines providing connectivity to 400 cities worldwide, Changi Airport handles about 7,200 flights every week, or about one every 80 seconds.